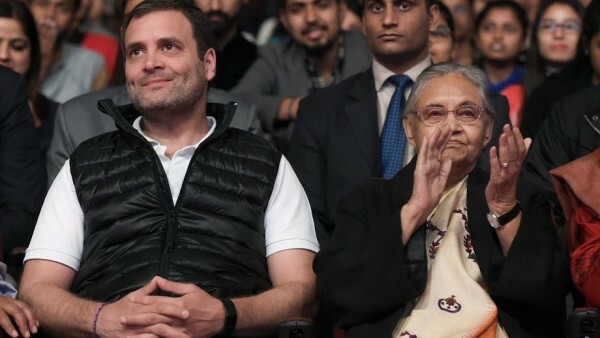 Shiela Dikshit has been standing between Rahul Gandhi and AAP. After weeks of swinging between yes and no, the Congress finally claims that it is the Aam Aadmi Party (AAP) that was backtracking from the seat-sharing "pact" between the two parties by seeking its extension outside Delhi, and that the party would now fight all the seven seats in the national capital alone if no agreement was reached. Talking to the media here, Congress leader P.C. Chacko said that AAP was keen on an alliance with the party in Delhi and so was Rahul Gandhi despite strong reservations of the party’s Delhi unit as the objective was to defeat the Bharatiya Janata Party (BJP). Chacko, who is also the Congress’ Delhi in-charge, said that discussions were held between him and AAP leader Sanjay Singh and the two parties worked out a formula under which AAP was to fight four of the seven seats in Delhi while the remaining three seats were to be contested by the Congress. “The policy of the Congress in the country today is to go for alliance with parties which aim to defeat the BJP and join us in this fight,” he said. “Delhi has the ideal situation in which the Congress and the AAP can come together to defeat the BJP in all the seven seats. The seat-sharing discussions were held with this understanding. We also arrived at a pact. Then there was a suggestion from the AAP that it wanted to also discuss Haryana and other seats,” Chacko said. He said the Congress was of the opinion that the political situation in one state was different from the other and that it was not practical or feasible to have an understanding in Haryana and Punjab. “We accepted the political necessity and arrived at a pact. But the AAP on Wednesday said it was not ready for a pact in Delhi,” he said. “We were willing and we are willing. But since they (AAP) have taken a difficult approach, the Congress is going to fight on its own,” he said. “Even today I want to say with full authority that the Congress is ready for an alliance with the AAP, provided it sticks to the discussions we had corresponding to our strength in Delhi. But if they (AAP) want to extend the pact to other states, it is not practical,” the Congress leader said. Chacko also said that with the AAP not taking “a practical view” of the matter, the Central Election Committee of the Congress has discussed the seven seats in Delhi and has almost decided candidates for four seats.